Another month, another update and I already am really starting to miss buying makeup for me. Although I did shop for my face wash and body wash just cause that was necessary but no beauty products or makeup at all. By this time I already missed A LOT of sales and some great bargains cause of this challenge. Please keep in mind I'm not allowed to buy any new makeup, beauty products, skin care or clothing etc and I only allowed myself to repurchase my daily essentials like face washes, body washes, makeup remover etc, along with some occasional purchases such as birthday's etc. Although I purchases some of the beauty products but yes!! 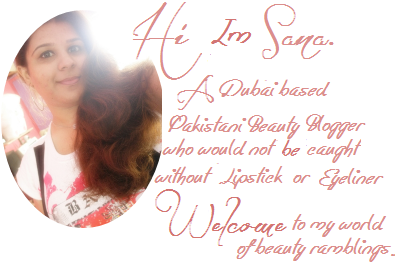 Not for myself, but for a Pakistani Beauty Bloggers Community 1st Ever Secret Swap and I'm seriously hoping this is going to be an awesome experience and if this experience gonna be well we might at PBBC going to have this Secret Swap which is similar to Secret Santa may be once or twice every year. Without any great difficulty till now this challenge is really helping me to put limits on myself along with it I might going to continue this challenge for another 100 days and yes, Im so going to start my 100 days weight loss challenge from Monday. I'm quite hopeful about it too as it will gonna help me to shed those some nasty stubborn kg's piled on me cause of being lazy and lacking workout routines. So lets just hope and fingers crossed for that. All and all I can say this certainly one of the most wise desicions I've made and I'm already seeing myself controlling my thoughts about spending HUGE amount on buying makeup and everything related to it. How is your spending ban treating you? 13 comments on " Spending Ban - Update No. 2"
I know its hard at times and its annoying missing sales but keep going and you are doing well! I am not finding it too my bad myself...and we are over the half way mark! Im in Pakistan. What does this secret swap mean? Are you gonna meet up with people? Wow, that is so hard. I can't resist sales, that is my biggest temptation! I keep thinking of imposing a spending ban, but keep buying things before I can implement it! kudos to you though for making it this far! Hang in there!! Sounds like an awesome challenge to creatively use what you already have. Best of luck.